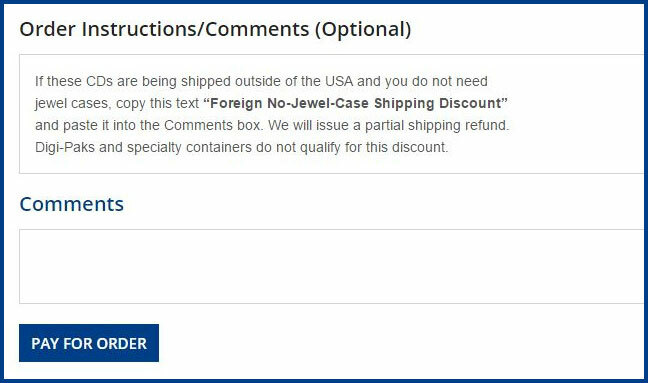 If you live outside of the United States and would like to have your CDs sent without jewel cases, please copy the provided text (Foreign No-Jewel-Case Shipping Discount) and paste it into the Comments box. You can also simply enter "No Case". This will reduce the shipping cost and save you money. A refund on the shipping charge will be sent to you by store credit, credit card or PayPal. Please be aware that only CDs with a jewel case container qualify for this option. Digi-Paks and Specialty containers do not qualify for a shipping discount. Also, our (per CD) shipping prices drop rapidly when additional CDs are purchased. For example, the shipping rate for a second CD is less than 1/2 the cost of the first. The per CD shipping prices keeps getting lower with more CDs!